The Columbia Type Writer was built by Charles Spiro of New York, who later designed the famous Bar-lock typewriter. 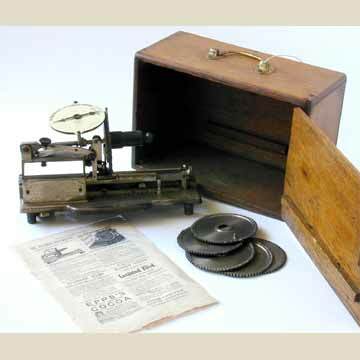 This index machine of 1885 did not sell very well and it is quite rare. Spiro was a lawyer and an accomplished violinist. In his youth he was an apprentice in a clock factory, which may help to explain the good looks of his machines. The Columbia index is a circular index machine. Characters are selected by turning the wooden handle attached to the vertical typewheel. This moves the arm on the index face, that points at the selected letter. As if to stress the sense of precision of a clock maker, the Columbia was the first typewriter to have proportional spacing. The first model wrote capital letters, but the Colubmia 2, that is shown here, wrote capitals and lower case letters. An intermediate model had used two typewheels to print lower case and capitals. The machine presented here came with a set of different typewheels.